Keep the germs in your kitchen at bay. Turn on your kitchen faucet equipped with MotionSense™ with the wave of your hand. 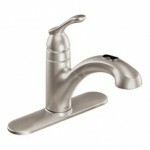 Today, we review the Moen Arbor with MotionSense™ Kitchen Faucet. If you’re a parent like me, you spend a lot of time at home, cooking up gourmet grilled cheese sandwiches, hamburgers, mac ‘n cheese, and beyond for your children. You often find yourself working with meats, vegetables and just about every other type of food in your kitchen. Often, my family and I like to go to Costco and buy meat in bulk. When we do this, we need to separate the meat before freezing it and sometimes get the juices on our hands. Rather than risk contaminating everything that we touch, this faucet works great in keeping germs at bay. 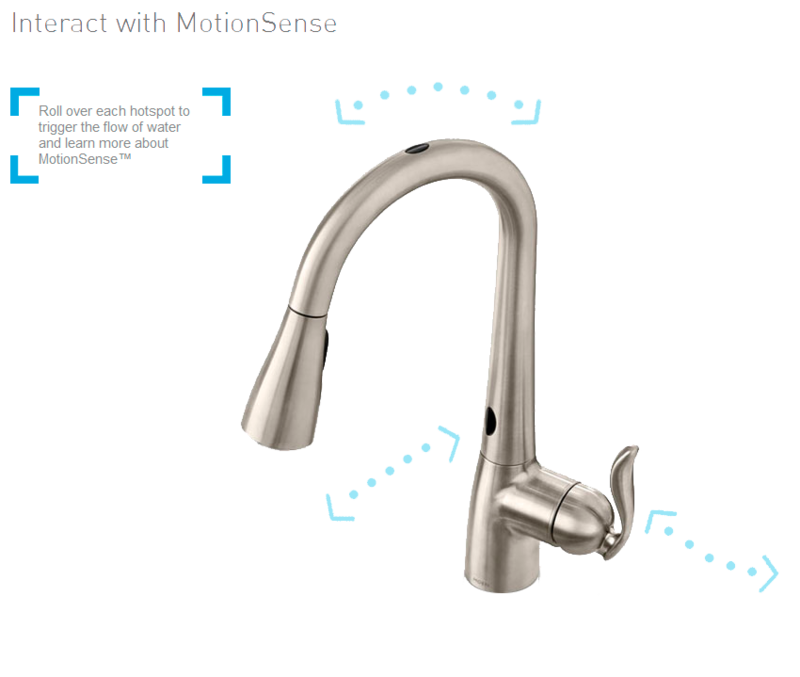 I must say that I’m very impressed with the Moen Arbor MotionSense™ kitchen faucet. The installation was relatively easy (you simply push each water connection into the terminal as far as you can and it locks into place and each of them are numbered so installation is almost foolproof), it functions perfectly, and best of all, it looks great. Our kitchen originally came with the Moen Banbury faucet but I couldn’t stand the fact that it would always fail to retract and it would hang there and not do its job properly for me when I was using it. That being said, I grew quickly frustrated when doing the dishes, preparing food, or just when washing my hands at the kitchen sink. I used to sell Cutco cutlery during my time in#while enrolled in college (I practically have the entire set at home and yes, I consider myself a knife snob). It didn’t make sense to me until now, when one of our common phrases that we would use in suggesting the sale of the knives (and it worked) is, “Nice people like nice things.” This faucet is one of those “nice things” to own. 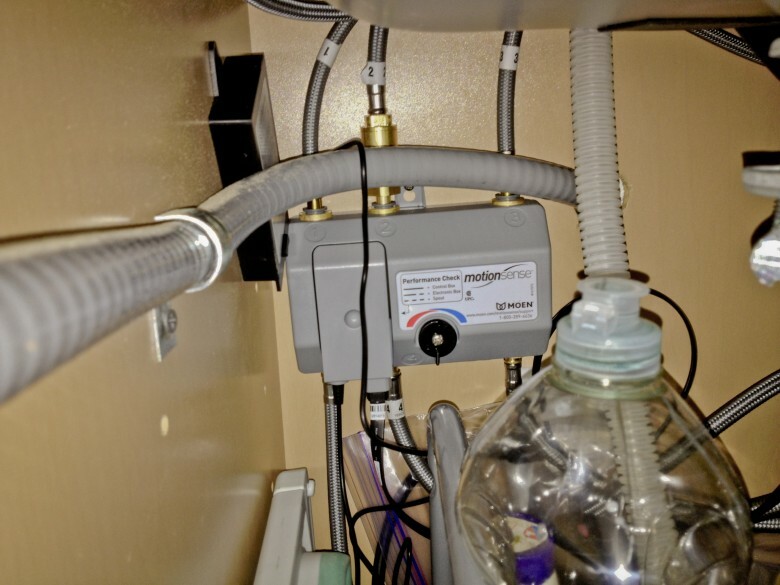 The only complaints that I read about online are that the connection points to the terminal where the sensor relay is located for the water hoses, where you connect the faucet, can come undone if not properly and securely pushed in the time of installation. For me, I have had no such problem. The relay box is battery operated and the batteries come with the assembly. 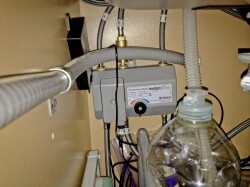 You can order an A/C adapter for the faucet for around $30, but the A/C adapter doesn’t come in the box and you cannot choose to purchase it as an extra add-on while you are at the store. We picked up our faucet at The Home Depot and we’re sure you can also pick it up at Lowe’s or just about any other home supply store. There are two sensor points on this faucet. One on the top. One on the base. The one on the top turns the faucet on and it will stay on until you wave your hand again over-the-top. The one at the base turns on only while you have something in front of it. There is also a setting on the sensor relay for the temperature that controls the temperature when either of the two sensors on the top or on the base are turned on. This is a great safety feature when little kids around because it will not be too hot nor too cold for little hands that do not understand the impact temperature just yet. You can override the sensors by turning on the handle to any temperature you like. 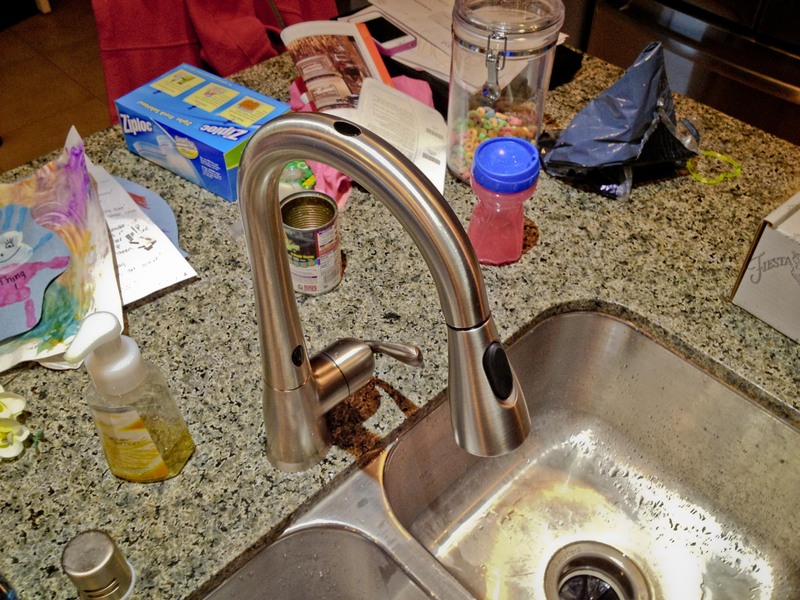 We picked up our faucet with the Spot Resist™ stainless finish that resists fingerprints and water spots for a cleaner looking kitchen because we all know life with kids can be dirty in less than 10 seconds. The finish looks great and we are really glad that we chose this finish. Overall, this is one of the best purchases that we’ve made since moving into our new home in November. 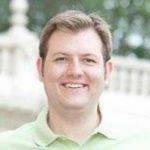 Now, I am not frustrated when turning on and using my kitchen faucet any more and I love turning on my faucet with a simple wave of my hand. 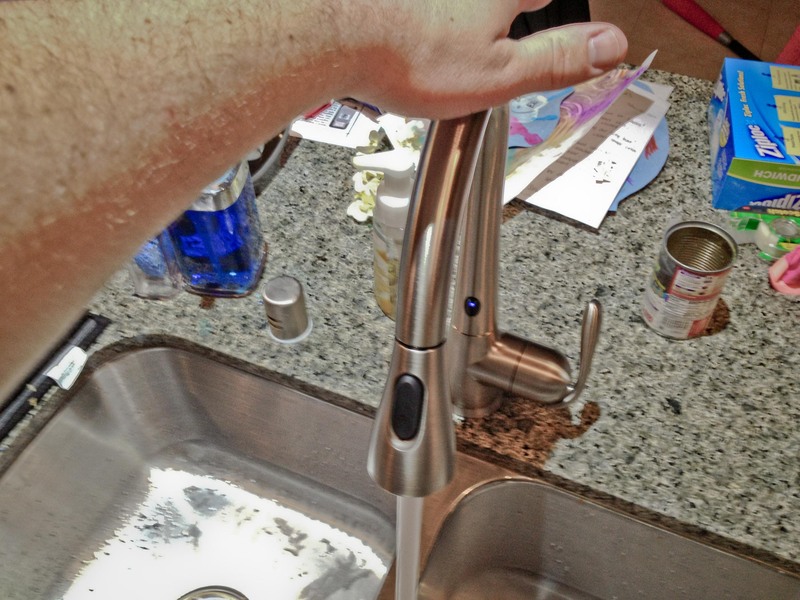 In fact, sometimes I find myself at a friend’s house waving my hand over their faucet, expecting the water to turn on. We’ve only had this faucet less than a month and I’m already conditioned to use it without thinking by waving my hand over the faucet. It may be a costly investment at first, but it’s well worth the money and I highly recommend it. Have you purchased this faucet yourself? What do you think? Does it stand up to the hype? If you do not have this faucet, you plan on purchasing in the future? 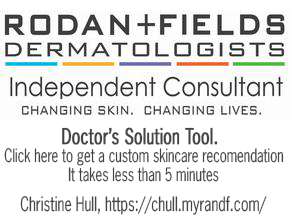 We would love to hear your thoughts. As always, thanks for the visit and reading this post on our site.